The La Salette Fathers introduced devotions to Our Lady of La Salette in the first church established at Forget in 1899. Pilgrimages were held here from 1922 to 1929. In the early fifties, under the direction of Rev. H. Poirier, an impressive outdoor shrine of fieldstone was erected. Annual pilgrimages to the shrine were revived by Archbishop O’Neill in 1954. 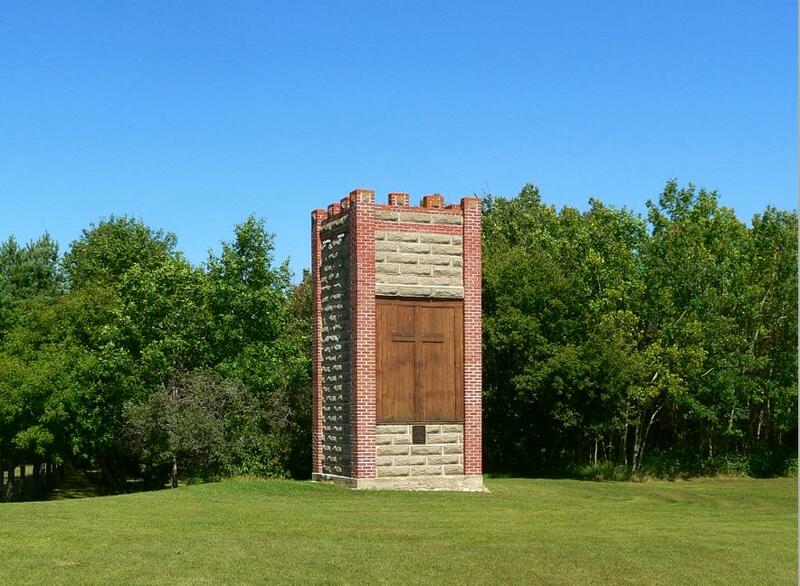 Our Lady of La Salette Shrine, in Forget, Sask. All are invited to join us for a day of faith and fellowship! Date: Sunday June 10th, 2018 Registration at 1:00 p.m. Mass at 4:00 p.m.
Venue: Forget is off Highway 13 and is 11 kms east of Stoughton. 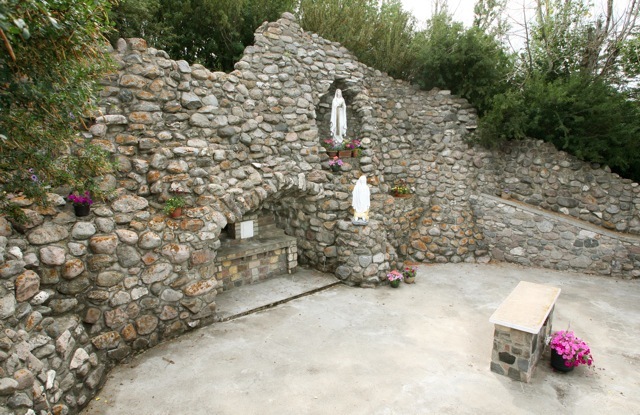 The grotto was built in 1987 to celebrate the Marian Year. 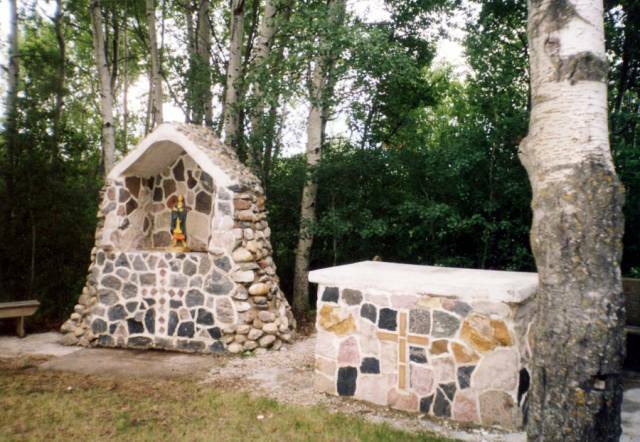 The Blessed Kateri Shrine and a native cairn were also constructed and in 1988 a Way of the Cross was added. The cairn is made of split field stones designed in the shape of an eagle, a traditional symbol for the Great Spirit. Annual pilgrimage is held Sunday June 24, 2018. In the 1930's and 1940's parish priest, Father J. A. Menard, encouraged devotion to Mary, Queen of All Hearts and received approval by Archbishop Monahan in 1942. In 1943 a statue of Our Lady was erected. In 1951 the title of the church was changed from St. Gertrude to Mary, Queen of All Hearts. Archbishop O’Neill authorized the erection of a shrine adjoining the new rectory . The first public pilgrimage was held during the 1954 Marian year. In 1908 Father Albert Royer founded the parish of Notre-Dame d’Auvergne (Our Lady of Auvergne) in this mainly French farming community. A 400-year old statue of Our Lady of Sorrows was given to Fr. Royer by a friend from Auvergne, France. The statue was originally covered in gold. It had been hidden by peasants during the French Revolution to save it from desecration and vandalism. The statue was the only thing to survive a fire that destroyed the church in 1922. The new church was completed in 1930 and in 1934 the pilgrimages began. with the Pietà and the release of the helium Rosary Balloon. Lunch will follow at the Parish Hall. Un goûter sera servi à la salle paroissiale après la Procession. The Speaker for the 2018 Annual Pilgrimage of Our Lady of Auvergne, Ponteix is Very Rev. Fr. Tiburtius Fernandez, SMA. Fr. Tiburtius Fernandez is born in Sri Lanka and he is a Priest of the Society of African Missions, SMA. Currently, he is the Superior of SMA Fathers in Canada. Father Tiburtius had his Schooling and Seminary studies in India. He holds a Master’s in Bible from St. Peter’s Pontifical Theological Institute, Bangalore, India and a Diploma in Communications from Association Catéchétique Nationale pour l’Audiovisuel, Paris, France. Fr. Tiburtius has been a Missionary Priest in West Africa for 14 years and lived in Canada for the last 10 years. For 5 years, he was part of the Pastoral Team at Saint Joseph’s Oratory, Montreal. Fr. Tiburtius has written many inspiring books in the fields of Homilies such as “Homilies for year A, B, and C” and other subjects. Venue: Our Lady of Auvergne Catholic Church, Ponteix, Sk Ponteix is 78 km west of Assiniboia on Highway 13. In 1933 Oblate Father Anthony Sylla, OMI was appointed the first resident pastor. Fr. Sylla had a personal devotion to Mary and he began planning the the building of a grotto with his Polish and Ukrainian parishioners. The onset of the depression years delayed his plans. Construction began in 1939 and in 1940 a large front wall and side wings were erected in the form of a half circle. On June 15, 1941, Msgr A.J. Janssen, Vicar General of the Archdiocese of Regina, blessed the shrine of Our Lady of Lourdes. The first pilgrimage was organized that year. 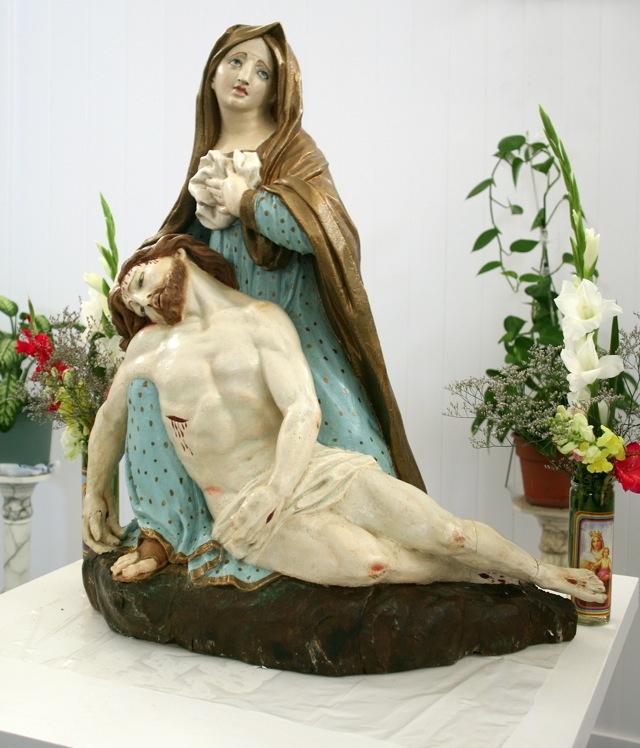 In 1944 a cross was placed on top of the grotto and statues of the Sorrowful Mother and Saint John were erected at the foot of the cross. Three statues of Christ were added to the grotto as well - statues depicting the Lord taken down from the cross, one of the Lord in the Tomb and one of the Resurrection of Jesus. In 1954 the Knights of Columbus donated a statue of Our Lady of Grace and built an artificial lake. 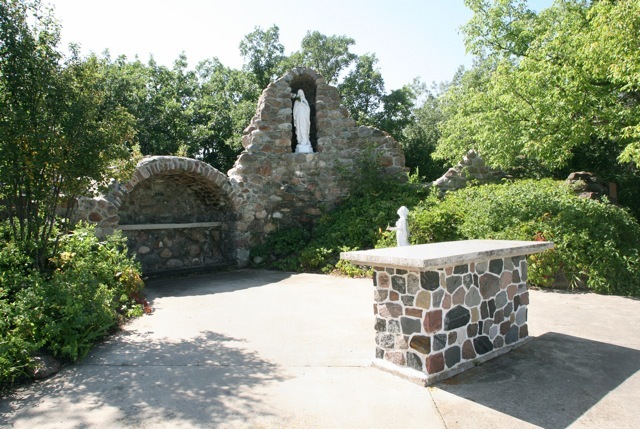 In the late 1959 the Stations of the Cross were erected around the grotto. Kaposvar is five kilometres south of Esterhazy, near the Manitoba border. Kaposvar was founded by Count Paul Esterhazy who brought Hungarian families to settle here in 1886. A simple log church was built in 1892. The present church was constructed on 1906 and 1907 by brothers of Father Jules Pirot. Hungarian settlers hauled stones by land boats from their surrounding farms and assisted in the construction of the church. It was officially opened in 1908. 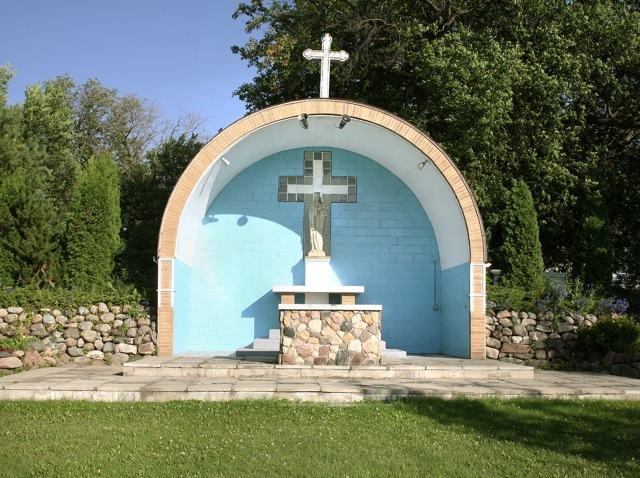 During 1941-42 the youth of the parish built the Shrine of Our Lady of Lourdes. The first pilgrimage took place in the Marian Year of 1954 and attracted some 2500 pilgrims. A stone Stations of the Cross was built in 1986. In 1961 the parish amalgamated with Our Lady of Victories Roman Catholic Church as there were no longer enough farmers to maintain the upkeep of the church. During this time Kaposvar was made a mission and used for weddings, anniversaries, or special request masses. Presently, it is still used for such occasions. 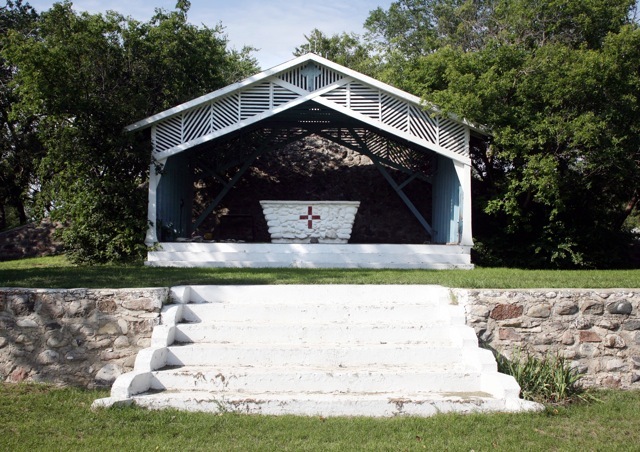 This historical site has been the scene of an annual pilgrimage each summer with hundreds of people in attendance.